4 Bedrooms ( sleeps 8/9) 3 shower rooms ,views of magnificent limestone cliffs. Just outside the village of Cabrerets with no close neighbours Trédède is a little corner of Paradise on the banks of the River Célé. Close to the prehistoric caves of Peche Merle and St. Cirq lapopie - one of the most beautiful villages in France. The property, in a natural setting, provides spacious accommodation on the upper two levels of this three-story villa. All four bedrooms have a double bed one of which has an additional single bed sleeping 9 in all. There are two shower rooms (one en-suite) and one bathroom. The living room (sejour) is spacious with comfortable seating, flat screen TV and DVD Player and dining area. WiFi is throughout the house. The separate kitchen is fully equipped with oven, induction hob, refrigerator, microwave, dishwasher and washing machine. Outside there is a balcony overlooking the river and cliffs and a dinning terrace. On the ground level there is a further dinning area beneath a gazebo with gas BBQ. The grounds have plenty of space for sun beds and recreation. We have a river frontage of 200 metres with towering lime stone cliffs behind, making bathing, fishing and canoeing possible straight from the property. The flat valley roads of the Célé and Lot rivers are ideal for cycling and walking. A 20 minute walk (3 minute drive) takes you into the village of Cabrerets with a boulangerie, small supermarket and restaurants. On Friday mornings there is a market in the village square. The house has full central heating for your comfort during those chillier times of the year. There is plenty of off road parking space and we are discretely on hand in our ground floor self contained apartment should you require any assistance or local information. Sarah and Roger have been running Trédèdé as a successful Chambre d'Hotes for some years and have 25 years experience in the hospitality business. Now we are getting older we have decided to explore the rental market. We love the stunning natural beauty of this area and the peaceful ambiance. The position of the house, by the river, makes it special to us and the friendly village is just the right distance away for a pleasant stroll. This property is ideal for an extended family or group of friends, or it provides spacious accommodation for a smaller group. It is situated in the countryside by the river without being too remote from the shops and restaurants in Cabrerets. Cabrerets is a pretty French village with two obligatory Chateaux - the old and the 'new' .The village festival in August with fireworks and pageantry is not to be missed. There is a rotary clothes line for guest use in the garden. If you need to use a Tumble Dryer ask owner to use theirs. Please bring your own towels for use in the garden and river. Free and throughout the house. Spacious living room with two sets of French Windows opening on to the balcony with views to the river and magnificent limestone cliffs. Flat screen tv. Basic items starter pack including tea, coffee, milk, sugar, S&P, Toilet rolls and welcome bottle of local wine. Comprehensive range Dishes and Utensiles for inside and outside use. Extensive library of English language books and some in French. Balcony to the south and west sides of the house with small tables and chairs. Can be rented locally and we also have our own which can be used at your own risk. Bicycles are available to hire locally. A terrace that opens off the west side of the balcony and is close to the kitchen and dining area. Ideal for apéros afternoon tea or morning coffee. We do not have a swimming pool but we have river frontage and you can swim in the river. Comfortable accommodation in a fantastic location. Peace and quiet on the banks of the Celè river. This is the place if you want privacy, quiet at night with a beautiful night sky. Beautiful environment to explore with lots to do nearby. All in all a wonderful vacation, will return! Well-equipped house in beautiful, unspoilt valley. Tredede is a very comfortable and well-equipped house and Sarah and Roger were very welcoming and ready with help and advice whilst keeping a low profile. The setting is stunning with the limestone cliffs, the river and the woods. Nature abounds with many birds and butterflies. We arrived in a heatwave, so the swimmable river at the bottom of the garden was just what we needed for cooling off. The surrounding area is relatively untouristy, despite its beauty, even in July! There are plenty of scenic villages to visit, including Cabrerets just down the road, lovely restaurants, and we found the locals very welcoming. We would happily return to Trédède and the Célé Valley. Wir ( 2 Familien) hatten einen wunderschönen erholsamen Urlaub. Das Haus ist sauber und gut eingerichtet. Wunderbar ist das große Grundstück welches direkt an den Fluß Cele grenzt in dem man herrlich Schwimmen, Angeln u. Kanu fahren kann. Das Grundstück liegt etwas außerhalb des kleinen Ortes Cabrerets (Lebensmittelladen, Bäcker, Restaurants) u. ist damit sehr ruhig gelegen. Es lassen sich herrliche Radtouren und Wanderungen in der wunderschönen Gegend machen. Es gibt insgesamt sehr viele Möglichkeiten für Unternehmungen. Die Besitzer des Hauses wohnen im Erdgeschoß und sind sehr nett und hilfsbereit. Zalig tussen het groen en aan een kindvriendelijke rivier. Door de bomen een koelte en voldoende schaduw. Huis was verzorgd en proper. Keuken was echt in orde. De eigenaars zijn de vriendelijkste mensen die we al tegen gekomen zijn. Ze doen hun best om alles zo aangenaam mogelijk te maken. In de nabije buurt zijn er ook opvallend veel goede restaurantjes. We hadden de fietsen mee en die zijn voor zowel recreatie als mountainbike goed gebruikt geweest. Trédère is a wonderful property on the banks of the Céle with large rambling grounds and private river access. The interior is spacious and very well maintained and allows for excellent river views and all the atmosphere that that suggests. The village is a two or three minute drive away for shops, cafés and restaurants so one feels secluded without feeling totally isolated. Highly recommended for a family holiday of peace and tranquility in an exceptional rural setting. True France-profond. Thank you for your review. We are delighted that you and your family enjoyed the peace and serenity that we enjoy here at Trédède. We feel that it IS a special place and hope you will come again. The new terrace should be open by next week and will add another dynamic to the Al Fresco experience. Jolie maison située un peu à l'écart du village, tranquillité assurée ! pièces spacieuses et bien équipées. Cependant il est à noter qques désagréments à savoir : mobilier bas de gamme et disparate, parquet bois qui grince horriblement et qui réveille toute la maison dès qu'une personne se lève, l'accès à la rivière est très compliqué depuis le jardin surtout pour des enfants (berges hautes), l'équipement de la cuisine est très complet mais de mauvaise qualité, les poêles et casseroles accrochent en permanence, le micro onde est HS, le frigo ne refroidi pas beaucoup et il givre, manque d'assiettes et couverts. Il faut également souligné que les propriétaires ont un accueil un peu "stricte", beaucoup de recommandations de d'interdits… le sens de l'accueil n'est pas dans leur nature et ils accueillent les touristes plus par besoin financier et cela se voit. En résumé meme si nous avons passé de bonnes vacances car la région est très sympa, j estime que la prestation est un peu légère pour un prix qui lui est haut de gamme . Il est a noter que la literie est très bonne. Thank you for your comments. Although some of them are critical, we do value the input of our guests and do our best to remedy any concerns for future guests. Based upon your comments, in the future we will be providing guests with a notebook providing information about the house, the area, sites and other items of interest rather than trying to convey all of this orally upon arrival when guests may be tired after a long journey. Then as the stay goes on, the notebook can be consulted rather than “recalled”. I do apologize if you felt as if we were less than hospitable. Of course, like other owners of rental accommodations, we enjoy the revenue the business produces, but we also enjoy welcoming visitors to this beautiful part of France and sharing our enthusiasm for the area. Concerning the microwave, refrigerator and light in the bathroom, of course, as you realize, appliances and fixtures fail. The refrigerator is only a year old so it is unlikely to have an issue, but we will ensure that it is properly cooling. The light fixture and the microwave were indeed not working. Prior tenants had not mentioned these problems so we had no way of knowing that was the situation. Had you but brought this to our attention during your stay, it would have been immediately remedied, which it was on the day of your departure. We are absolutely committed to the comfort of our guests, but we must be made aware of a problem before it can be addressed. We assumed that the kitchen equipment was satisfactory, having received no previous comments from guests. However, we will certainly supplement and upgrade what you found lacking. We typically replace part of the furnishings each year and we will take particular note of the sejour this year. As to the river, we are a bit limited in what we can do since it is a protected waterway and also is prone to flooding in the early spring before visitors arrive. That said, we have plans to make a more permanent, “flood proof” access and seating area for the enjoyment of our guests. I do appreciate that you commented that the house was spacious and well equipped and enjoyed visiting the area. We believe it is one of the most beautiful in France, offering wonderful recreational and tourist activities. French translation to follow.in due course. See map on our website. Close to the Grotte de Perche Merle, St Cirq Lapopie and the valleys Célé and Lot the area is rich in magnificent scenery with plenty to do from sampling the delights of the local restaurants and markets to exciting days out at one of the activity centres. 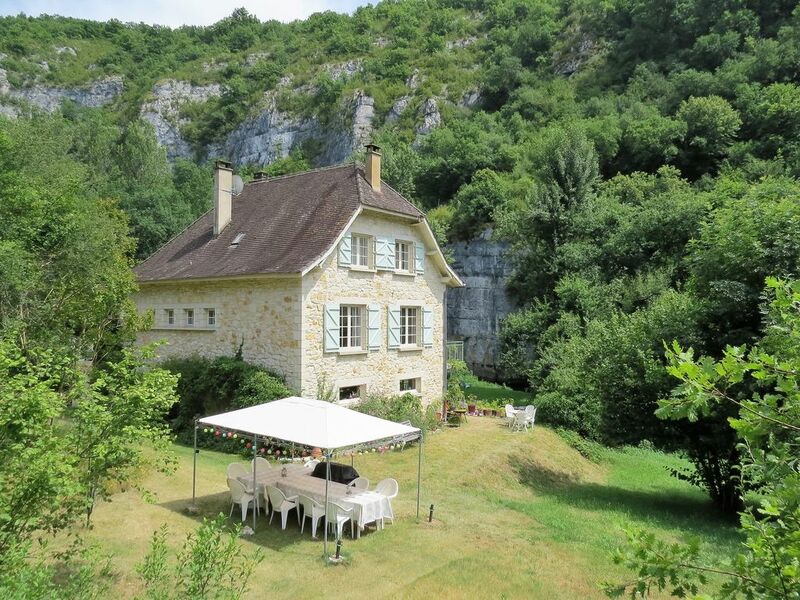 The House set in natural surroundngs on the banks of the River Célé with no near neighbours and with direct access to the river for swimming and canoeing. Nearby Cabrerets has Bars, Restaurants and an Epicerie and Boulangerie also a weekly market.